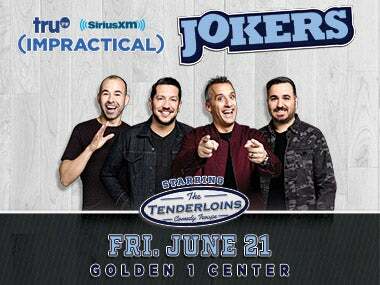 Critically acclaimed, world renowned comedy troupe, and stars of truTV’s hit series Impractical Jokers, The Tenderloins have a stop at Golden 1 Center in 2019 for their upcoming world tour titled “The Cranjis McBasketball World Comedy Tour – Starring The Tenderloins.” On the heels of the group’s hugely successful “Santiago Sent Us” tour, “The Cranjis McBasketball World Comedy Tour” will feature completely new material and hi-jinx for audiences across the globe. The tour will stop in Sacramento at Golden 1 Center on Friday, June 21. Tickets are available for general public on Friday, October 12 at 10 a.m. at Golden1Center.com. In addition to touring, The Tenderloins continue to have a very busy and productive 2018. This past March, the group announced plans for an official Impractical Jokers feature film to be directed by Chris Henchy and produced by Funny or Die. TruTV also renewed the show for a 26-episode eighth season that will extend the series on truTV through 2019 and beyond, 200 episodes in all.